Earlier I had posted a picture of my frothy leaf socks in progress. Well, those socks are no more. I liked the way they were turning out, but in my current knitting reality, in which I have less time and feel more brain-dead in the time I do have, it was too much to keep track of. So after messing the pattern up several times, I stopped, reevaluated, and changed my plan. 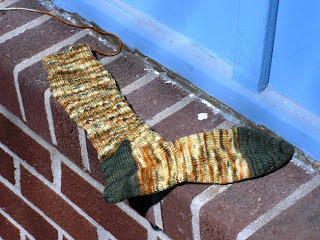 I used the same yarn to knit up Gentleman's Fancy Sock from Nancy Bush's Knitting Vintage Socks. Much better - this pattern I can pick up and knit on without much thinking. I have finished the first sock, using yarn left-over from socks I made for my Mom a couple of years ago. I have started the second sock, but haven't worked on it much lately. I think later today I will get back to it. But I still have a problem - What to call it? I am not very good at naming things. Any suggestions? The picture below is fairly true to color.